The yard was fun for lawn darts, if they were still legal. Croquet is a game I used to play as a child, and we don't throw ball any longer. Now it seems our lawns are areas of concern, needing work, weeding, watering, etc., yet we also need room for entertaining, large family gatherings, or similar activities, just a little less physical. A Deck or Patio can get you that space outdoors, which invites you and your friends to the outdoors. 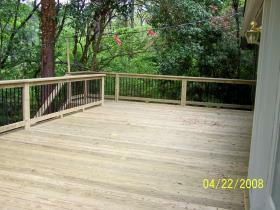 Remodeling a deck by enlarging or simply resurfacing your deck, will make that existing deck an area that you would want to go out and enjoy, once again! Now there are many different options, not available to us during the "lawn dart" age! 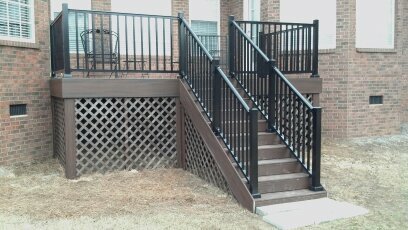 From treated lumber, stained or painted, to composite decking, with aluminum handrails, or a mixture of these items, can allow more outdoor activities, and improve your visibility to the surrounding area, if desire. All Pro Improvements offers Design and Build for your planned projects, indoors or out. Seeing your project, before it is built, helps to realize the end product, but you won't believe the final end product, until construction is completed! This drawing shows a large deck, with a cement patio below for the planned hot tub. The home is not drawn, and the surrounding trees are not shown, allowing the full image of the planned deck only! 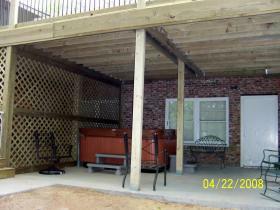 Still can't see it, then see the below photo showing the hot tub patio, and the detail of the lattice work below, which created additional storage for those water proof items! Now look back to the drawing, and see how the plans were altered to the newly constructed deck and patio! The image far left shows the top of the deck, following construction. 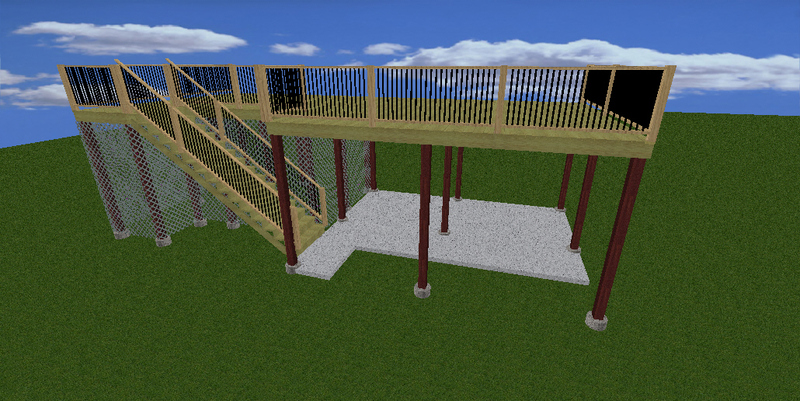 Note the handrails are a combination of treated lumber, with aluminum balusters to better allow visibility of the surrounding natural landscape, trees, etc. Now we have the Composite Decking, with various manufacturers including Trex, Azek, Choice Dek, and more trademark names, which also brings some confusion as to just which Composite decking installation and service you would want! What type of handrails would you want? The best answer is to question on HOW YOU PLAN TO USE YOUR NEW OUTDOOR SPACE? with aluminum handrails. 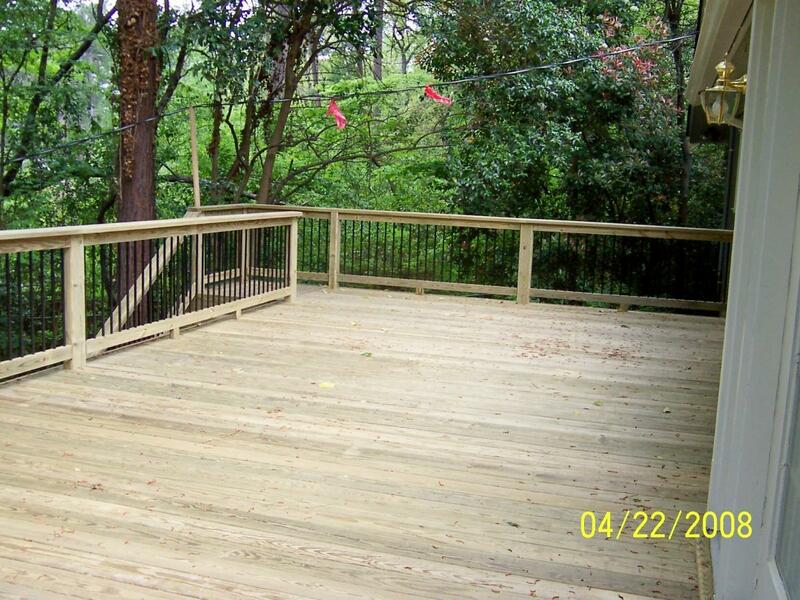 This particular deck was actually a re-surface of the existing deck, by removing the original decking boards, and installing new Trex Transcends decking boards, along with black aluminum handrails, for a truly finished look! 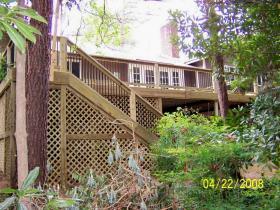 Even the forethought and planning for matching lattice below this deck makes for a beautiful enhancement to any home! Never needing painting or staining, this is truly low maintenance! Patios and pavers are other options, when you don't need or desire to be so far off of the ground! Often less expensive than a newly constructed deck, a patio has advantages also to be realized, including low maintenance! Stamped concrete has maintenance to be realized, requiring period sealing of the surface of the concrete, that would not be necessary with a natural stone. 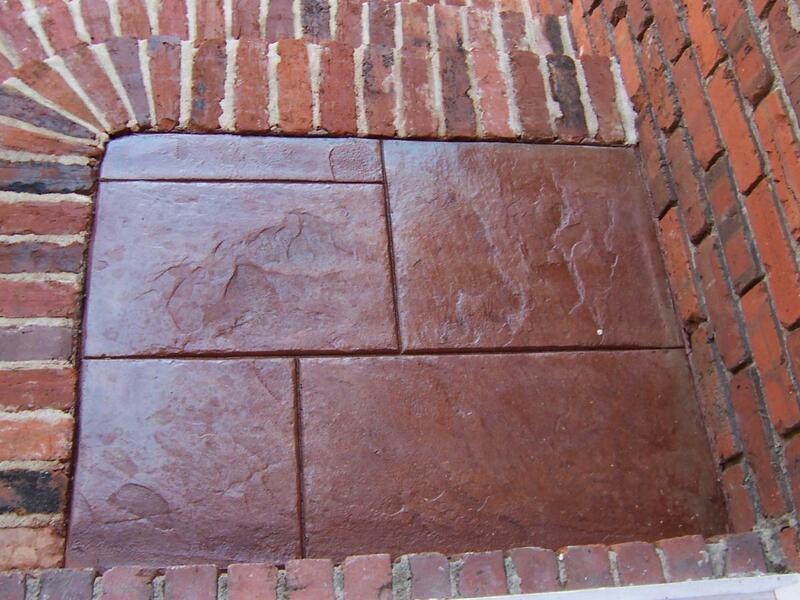 Stamped concrete is concrete, literally stamped with a design of a stone type, and colored to your desire. These often emulate the look of pavers, slate, or other natural stones, but can include customized designs of your favorite team or theme! 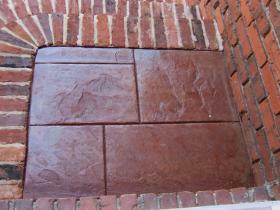 This stamped concrete with slate look was colored redish to go along with the existing brick of that home! Pavers are yet another option of reclaiming that back yard of little use, with little maintenance of periodic sand swept back into the crevaces between the pavers every couple of years, depending on the water flow at your location. Gutters can help to minimize this. Pavers are concrete stones, man made and colored, set upon either a concrete surface, or normally upon a gravel bed packed to near 98% compaction (a stone is 100% compaction!) and a bed of masonry sand placed upon that gravel, and packed again and leveled, before the pavers are installed. This process allows the paver system to drain, and can be placed in places that drainage is already a known potential problem! The retaining walls surrounding this paver patio system is not only steps to the surrounding yard, but also seating when needed. The true function of this retaining wall that matches to the paver system, is to hold back (or retain) the earth behind the wall. This retaining wall was lined to prevent water from passing through, and a French drain was installed, as the back yard is much higher than this new Paver style patio! In this view, you can see this large, 14 foot wide, by 56 foot long paver patio system, and the surrounding terrain, and why the paver system was best for this home and location! You cannot see it, but below the pavers, at a planned future hot tub area is a cement slab, to support the planned hot tub, and the weight, while keeping the tub from tilting over time. Pavers up close and personal shows how a professionally installed paver system can go around plumbing, wiring, and more! Custom cutting of these pavers to curves and even to straight lines makes the paver patio appear as if was there, long before these other items were introduced, making the paver patio a natural accessory to your home, and impervious to lawn darts! send us an email, but expect a prompt response! We want to improve your back yard, front yard, side yard, as well as your interior and exterior of your home! This paver patio was the final step following the new windows, siding, and roofing for this homeowner! Remember to see our Gallery for an ongoing and growing display of our remodeling projects in the Greater Columbia SC area.